Can be installed over existing floors  such as, concrete, natural wood, vinyl and linoleum. 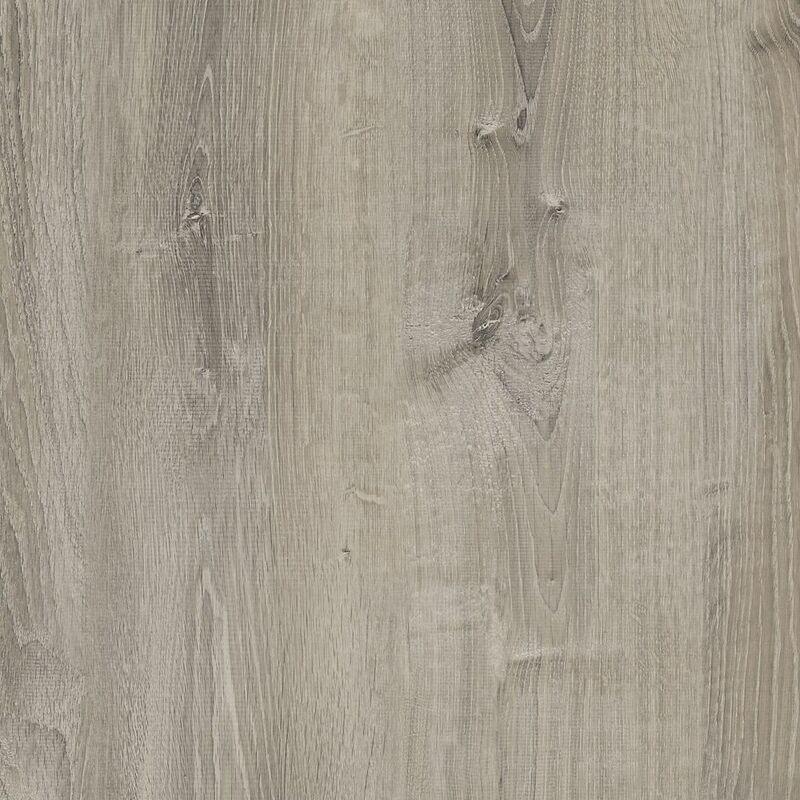 Smoked Oak Silver 8.7-inch x 47.6- inch Luxury Vinyl Plank Flooring (20.06 sq. ft. / case) With Allure LOCKING, you can transform any room in your home quickly and easily, saving you time, effort and money. Allure LOCKING (Clic<sup></sup> design) simply clicks and locks planks to each other, not to your sub-floor. Its FREE FLOATING and completely GLUELESS! Nano Ceramic Bead Technology 20-mil wear layer gives Allure LOCKING super durability and greater strength and performance. 5-year commercial, lifetime residential warranty. Home Depot Exclusive Product. Smoked Oak Silver 8.7-inch x 47.6- inch Luxury Vinyl Plank Flooring (20.06 sq. ft. / case) is rated 3.4 out of 5 by 11. Rated 2 out of 5 by discerningshopper from Very difficult floor to work with I've installed many floors of all types and this is about the worst to work with. If you follow the installation instructions and join the short ends first it's quite difficult to slide it into the long side. It's advertised as being really easy but not only are the planks hard to connect, they frequently pop out as you join subsequent planks. I chose this floor for its thicker wear layer, but I became more concerned abouit the planks coming apart with use, so I wound up gluing every other row down. Wouldn't choose this floor again. Rated 5 out of 5 by Contractor from Tricky Install but Well Worth the Time As other reviewers have posted, this is a tricky/tough product to install, but not impossible. Experience definitely helps, and once you figure out the system, the install runs fast. The locking system works well and the durability is unmatched. I was able to score most straight cuts with a knife, and angles and notches were easily made with a jigsaw or tablesaw. My only complaint would be to add more variants to the grain design. Rated 1 out of 5 by Carpenter from Design failure I've installed dozens of kinds of vinyl flooring as a carpenter and this one is about the worst. As MANY reviewers mention above, the lap system just doesn't work. First off, it's snapped in both directions which should've been my first clue. A truly impossible feat. Secondly, when you do a proper stagger, the other end of the plank pops out. I relayed my original 10 planks probably 10 times before I was able to get it started well. Then, laying the next ten planks, I see that my original 10 planks started to magically open up at the long joints! So I took it all apart and tried again. Same thing happened over and over and over again. I could've laid tile faster than this. I could've laid hardwood faster than this. I could've laid sheet vinyl faster than this. Just run. It's BAD! Rated 5 out of 5 by AliC from Amazing and durable We used this for our cottage on the beach. Hides the sand and it doesn't matter if people walk in from the lake with wet feet. We love the durability. Easy to clean and looks great!! Rated 4 out of 5 by Bluechip from Not an easy install but great product I had trouble with some joints. It's not as easy as click and lock all the time. Placed at the right angle the floor goes together like a charm but on some occasions as one end was locked in the other came out, just a millimeter, but still had to do over. I recommend having a helper hold the end in place. Very fragile lock system that broke off in some places. It didn't affect the look of the finished floor but during install you had to make sure the joints were kept clear of debris and bent tongues. I tried scoring to cut but it took many passes of a sharp blade to get deep enough to enable it to snap off. Very tough floor. I used a jig saw for most cuts. Overall a bit frustrating and tricky to install but it certainly looks great once down. I installed directly over a tiled bathroom floor. I'm unsure whether or not I would buy again. Last floor I glued down and it was super easy but that was on a sub-floor. This is convenient in that it went directly on top of tile. Rated 5 out of 5 by do it yourself doug from Looks Fantastic. Installed it myself, with limited carpentry experience from my youth. Installed 700 sg ft of this product on a condo concrete floor. The click and lock, although a bit tricky, was easily caught on while installing. Simple to cut by scoring a couple times with a utility knife and a square (I did use a jigsaw for some of the complex cuts). So far every guest to my home has had the same thing to say about this product "beautiful floor". Rated 5 out of 5 by allansplace from Nice to work with and when finished We've had the flooring since Oct. 2015. It still looks good with no scratches or other problems. The store was back-ordered, so we waited for a week for half the order. Installation, once we figured out how it went (read the directions, maybe? ), went smoothly and quickly. I recommend some laminate flooring tools to ease the process. One person cut them with either a utility knife or a scroll saw, and the other (me) installed and measured. Pretty much flawless. Product is HEAVY to carry in. Overall, very happy. I'd like to do the rest of my house in it now - when there's extra money. Living in a condo-can I lay LVT underlay(recommended for sound proofing),under this product-and if so will this void warranty? Thank you for your question- We do not recommend using underlay as this will void warranty. Hi, We have 2 existing layers of glued down vinyl(old stuff). Can this product be installed on those 2 layers? My concern is that, with time the locking mechanism might be compromised. Any suggestions, thoughts? Can this vinyl plank be installed in a herringbone pattern? Thank you for your question. No, you cannot install the Isocore in a herringbone pattern. Does this flooring contain phthalates? Thank you for your question. No, the flooring does not contain harmful Phthalates. Thank you for your question. Please see the notes from page 6 of the manual &quot;Tile (Stone) Yes. Ceramic, Terrazzo, stone tile (grout lines of less than 1/4&quot; or 6mm is optimum&quot; .&quot; You cannot install any Allure flooring over Laminate. Thank you for your question. The Smoked Oak Silver is required to stay in temperatures between 55-85 Fahrenheit (roughly 13-30 degrees Celsius) for the life of the product. Excessive temperatures will damage the planks and void the warranty. Can this product be installed over 12&quot;x12&quot; ceramic tiles? If no, what do have any recommendations? Thank you. Thank you for your question. Yes, this flooring can be installed over 12&quot; x 12&quot; ceramic tiles. what is the AC rating on this product? Thank you for your question. Vinyl flooring does not have an AC rating. Please call our customer service team for further assistance at 866-843-8453.